You are currently browsing the category archive for the ‘Road Biking’ category. The plan was to get out from work about 5 and try and head out for 3 hrs. Something got stuffed up so didn’t get riding till 6 but the weather was lovely and warm. I had pretty much decided to just go for a ride and see what I could find. No training structure or anything like that…just for the pleasure. Well. Within 8 minutes I discovered Lausanne is very steep but with intentions of trying to explore further out I took direct route up. Around the 20% mark. Pretty muscular on a compact. I have a very basic map of lausanne in my head so found the bottom of Epilanges wood by default. Nicely warm now. I spotted a steep road and kept it going. Bloody hell! The sign said 22% and it went on and on but with winding parts and ‘slight’ rests. Was a very pretty forest though. Topped out into a slightly different spot and found road I had been sort of aiming for. Great views of the lake and mountains opened up. A REALLY stunning and clear evening. Started up a road but it was too busy for my liking. I wanted quiet backroads so turned off and followed my nose. 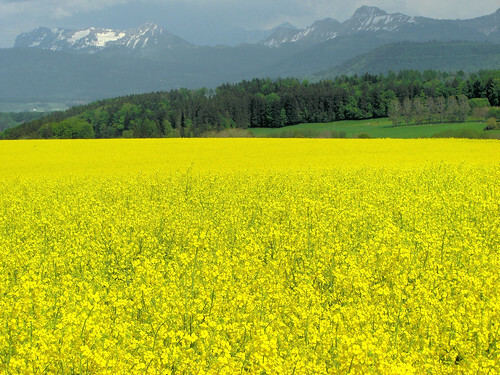 Through lovely rapeseed fields and other rural type settings, pockets of forest, hills. Darlings Buds of May sans horty Welsh Bint and much more spikey Alpine backdrop. Bombing round a corner I spotted another hill. I wanted to get up that. Followed the sign for ‘tour de Gourze’ just for the name really. The entrance noted a 25% hill marked. Goodness me. Goodness Me Indeed. It went up and up. Short flat bit to admire the stunning Vaudoise houses and view, catch breath and back to Painsville. I came round corner and rested on the flat to look up. Bang. Straight up and a good kilometre of it. As I started up a car came by and the driver gave me a big smile and thumbs up. He whined up the hill in first gear which was juxtaposed with my grunting at about 30 rpm. Reaching the top I was drenched with sweat. Rode round in a circle for a while to gather myself and had a look around. Wow. Back down, around, along. Stunning houses and views. Loving it. Back round above the lake and next to the Autoroute. Surprisingly quiet but just enjoying the ride. Raced a moped for a while and then hammered back through the streets of lausanne which was FUN. 2 hrs, 900m, 40k and a great discovery. I reckon there is a time trial potential from the lake straight up 5km and 550m to the said top of hill. Anyone? La Dole. The Road Bike Return! Evening ride. It was supposed to be gentle, low intensity. I had good intentions but Jerry shot off with in 6 mins. It was supposed to be low intensity for HIM! Off we went through the traffic, gently climbing but moving at a fair rate. Off the main road, avoiding commuters and into the little village Just For The Name: ”Gingins’! We had sort of a broad plan but when we saw the sign for La Dole I couldn’t resist… The climb wound itself through beautiful houses, forest positively bursting with spring greeness and a lovely temperature that hid the sweat. The gradient grew steeper, gears shifted up and talking got harder. On and on but so very good. Parts reminded me of this but dry and lovely. The road turned into one way so no worries about traffic, not that we really saw any. We eventually started seeing the top and slowly but surely spotted the Dome on La Dole. A quick looksee to see the potential of riding up there and returned back. I’d forgotten to bring a spare top but we flew down the mountain dropping into warmer temps. Again the road was one way so less worry on the blind corners. A really beautiful road. Down onto the flat, nostrils full with the smell of spring and BBQ’s. A little visit to the French border and Jerry and I parted ways. Back to Geneva for him and Roll for me. A good 15km spin, hunger pangs and fading evening light. 51km (with 26k in the morning), 1100m up makes a good ride indeed. Simply stunning. A little road ride tonight beckons for Jerry and I. Just two men dressed in lycra riding through the countryside…Its normal. Road ride into the Jura. Gland (Helmet) – Burgins – Gimel -St George – Gimel – Rolle. It really is ace round here to ride. Big hills but not super steep so you really feel like you fly up them. This one was a bit more rolling but I followed my nose with an idea to head to the Col de Marcheriuz. Following the 5 x 12 min Threshold efforts with 6 min recovery. The power that comes out of my legs these days is something to behold (well, for me, not anyone else). An indescribable feeling of satisfaction from all the winter training to finally see real results of speed and endurance. So a quick 1hr 25 mins, 660m climbing, 950m/hr climbing rate!! (Not sure if thats right) and a round 1000 cals. I am now loving the road bike going DH. The final road down to roll is fast with lots of swooping corners. Before I was quite gripped, on the drop bars and braking a lot before corners. Now, I sit on the top of the bars and barely touch the brakes and drop shoulders through the corners. Really is quite exciting! April. Not May, Not June. When its sunny and 14 degrees down by the lake what temperature do you think it will be in 2 hrs after 1100m of climbing? Even with tights, thermal, jersey, Windstoper and skull cap I thought I was done for. On a warmer note I did find a beautiful way up into the lesser known Jura. Loved it. What a beautiful day. A real spring beauty so I decided to ride in the longer way over Signal De Bougy and via Aubonne (adding 500m of vertical). It was not as warm as it looked and infact was 8 degree’s at the lake and 4 degrees up high. Dressed unsuitably I got a stunning ice cream headache for 45 mins but was wide awake and happy to be turning the pedals. No sign of her so kept going past Gland and eventually came to Nyon. Hmmm. No Kate and a lack of light. Turned round and belted it back with complete light failure and no lights. Luckily the cycle lane is well protected and I crawled in at 8:45 to find Kate relaxing on the sofa. Turns out she has new bike speed and had done the ride in a new record time! !